Click for a full size image. Book available at amazon.com. At their request back in the 1990s, I provided assistance from this side of the Atlantic to two journalists in Great Britain, Ian Ferguson and John Ashton of TV Channel 4 in London. 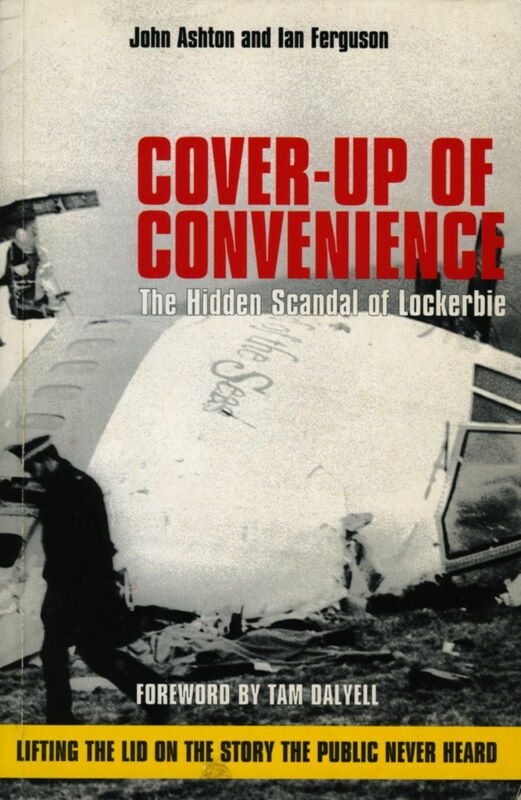 At issue was the late December 1988 bombing of Pan Am 103 which crashed killing all 259 people on board—243 passengers and a crew of 16—plus 11 more fatally injured in the village of Lockerbie, Scotland, by falling debris, a total of 270 dead in all. The flight had been on its way from London to Detroit and included 175 American en route home for the Christmas holidays. In the course of my own investigative efforts, starting belatedly in 1993, I became aware of information extremely pertinent to an understanding of what had happened that I subsequently shared with Ferguson and Ashton as their work on the case proceeded. It quickly became apparent that the official prosecutorial thrust in the direction of Libyan guilt for such a terrorist attack was entirely misguided. I even furnished the same information with documentation to a couple of Scottish prosecutorial investigators who actually flew all the way to Arizona to interview me in a Phoenix hotel room, later learning that their report of the interview was neither followed up nor shared with defense attorneys for two Libyan defendants falsely accused in the plot. One of them, Abdel Baset Mohammed Ali al-Megrahi, ultimately would be improperly convicted in January 2001. Iran, furious over the apparently careless shoot-down of its civilian airliner in July 1988 by American navy ship USS Vincennes, killing 290 people, contracted with Syrian military intelligence in the person of Ahmed Jibril (variant spelling Ahmad Jabril), directing for Syria the Popular Front for the Liberation of Palestine/General Command, to bring down an equivalent U.S. commercial flight. Aided by PFLP/GC associates Abu Talb and Marwan Khreesat, Ahmed Jibril soon managed to do exactly that, successfully targeting Pan Am 103 in December 1988. The ensuing official probe of the Pan Am 103 bombing led time-wise into the run-up of the first Gulf War, in which U.S. President George Bush The Elder wanted to include Iran and Syria in his “coalition of the willing” to oppose Iraq’s military occupation of Kuwait. That would have been impossible, of course, if he simultaneously was pushing for Iranian/Syrian punishment for Pan Am 103. In a sort of international version of the “usual suspects,” Libya, long an attractive target, was designated to become the alternative fall-guy for Pan Am 103, appropriate evidence and testimony duly manufactured. My personal suspicion is that Robert Mueller, a former U.S. attorney in California, recruited to supervise and secure the Libyan “fix,” later was rewarded as a good team player by being named director of the Federal Bureau of Investigation. In early March this year, the increasingly impressive TV news folks known as AL JAZEERA AMERICA aired a special edition of its “Consider This” feature devoted entirely to its own independent, several-year investigation of the Pan Am 103 tragedy. I’m happy to note that it finally got it right as well, fully exposing the original misdirection of the case at U.S. urging. Here is a link to the related press release for the recent broadcast. As an addendum to the promotional release, Steve Goldin, a colleague watching the AL JAZEERA AMERICA broadcast—I regrettably lack that particular news channel—made notes at my suggestion which specifically reveal an especially disturbing detail. According to the broadcast, this reinvestigation was able to determine through scientific analysis that the fragment of a small electronic timer used in the bomb, reportedly recovered at the crash site, does not, in fact, match the timers sold by a Swiss electronics firm to Libya. To the contrary, it has had a distinctly different point of origin and transactional history. Had that exculpatory evidence been known at trial, as now revealed by Goldin’s note from the broadcast, it “would have destroyed the prosecution’s case.” Suffice it to say that such was precisely among the information I already had discovered in 1993, thereafter provided to Scottish prosecutors as well as to authors Ferguson and Ashton. And that would explain why Scottish prosecutors, undoubtedly under great U.S. pressure, opted to suppress it. Hey Don I was telling a friend of mine about you a few weeks ago. Glad to see you posting again!